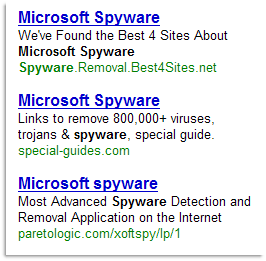 The screenshot on the right shows Google Ads for Microsoft Antispyware keyword displayed on Google Homepage. None of these Google Ads link to any credible website, instead they are exploiting an old trick to make money called Adsense Adwords Arbitrage. Microsoft is clearly not impressed with the whole idea and they have sued a Google Adwords user, Seth Traub, who employed a similar approach to sell Spyware Cleaner software which Microsoft alleges is a spyware itself. Traub ran ads, using Google's AdWords program to create an advertising link reading "Microsoft AntiSpyware." It was displayed when users searched for terms like "Microsoft spyware cleaner," or "Microsoft antispyware." Traub's ads earned him 75 percent of the $49.95 unsuspecting users would spend to purchase a copy of Spyware Cleaner. It works like this: There are two URLs associated with each AdWords ad: display URL and destination URL. Google Adwords policy allows advertisers to keep the display URL different from the actual destination URL. That means, a Google Ad can show the destination URL as www.ebay.com but clicking the ad might take the visitor to some personal homepage or even an ebay competitor. Now, you are more like to click an ad if the display URL is of a popular website. Spammers and Adwords Arbitragers know this even better.